"(for an industrial IoT problem) Matrix Profiles perform well with almost no parameterisation needed." Anton et al ICDM 2018. "While there will never be a mathematical silver bullet, we have discovered that the Matrix Profile, a novel algorithm developed by the Keogh research group at UC-Riverside, is a powerful tool." (full post). Andrew Van Benschoten, lead engineer at Target. 1) Given only the Matrix Profile, most time series data mining tasks are trivial. 2) The Matrix Profile can be computed very efficiently. 3) Algorithms that are built on top the Matrix Profile inherit all its desirable properties. 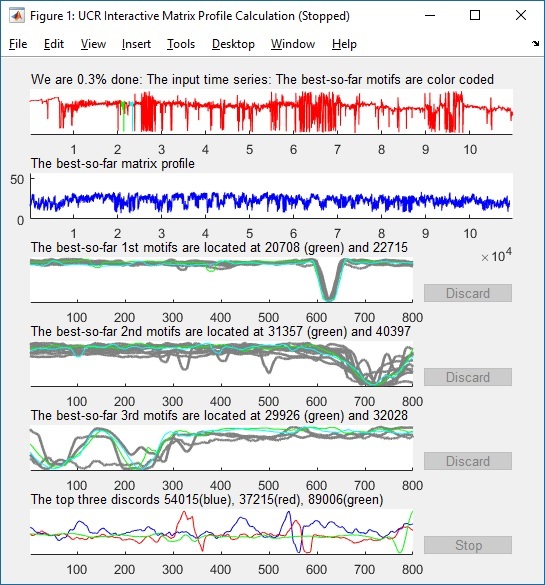 For example, we can use the Matrix Profile to find time series motifs. Because the Matrix Profile can be incrementally computed, we have the first incremental time series motif discovery algorithm. Because the Matrix Profile can be computed in an anytime fashion, we have the first anytime time series motif discovery algorithm. Because the Matrix Profile can leverage GPUs, we have.. It is exact: For motif discovery, discord discovery, time series joins etc., the Matrix Profile based methods provide no false positives or false dismissals. It is simple and parameter-free: In contrast, the more general spatial access method algorithms typically require building and tuning spatial access methods and/or hash function. It is space efficient: Matrix Profile construction algorithms requires an inconsequential space overhead, just linear in the time series length with a small constant factor, allowing massive datasets to be processed in main memory. It allows anytime algorithms: While our exact algorithms are extremely scalable, for extremely large datasets we can compute the Matrix Profile in an anytime fashion, allowing ultra-fast approximate solutions. It is incrementally maintainable: Having computed the Matrix Profile for a dataset, we can incrementally update it very efficiently. In many domains this means we can effectively maintain exact joins/motifs/discords on streaming data forever. It does not require the user to set similarity/distance thresholds: For time series joins, the Matrix Profile provides full joins, eliminating the need to specify a similarity threshold, which is an unintuitive task for time series. It can leverage hardware: Matrix Profile construction is embarrassingly parallelizable, both on multicore processors and in distributed systems. It has time complexity that is constant in subsequence length: This is a very unusual and desirable property; all known time series join/motif/discord algorithms scale poorly as the subsequence length grows. In contrast, we have shown time series joins/motifs with subsequences lengths up to 100,000, at least two orders of magnitude longer than any other work we are aware of. It can handle missing data: Even in the presence of missing data, we can provide answers which are guaranteed to have no false negatives. Given all these features, the Matrix Profile has implications for many, perhaps most, time series data mining tasks. Matrix Profile II: Exploiting a Novel Algorithm and GPUs to break the one Hundred Million Barrier for Time Series Motifs and Joins. Yan Zhu, Zachary Zimmerman, Nader Shakibay Senobari, Chin-Chia Michael Yeh, Gareth Funning, Abdullah Mueen, Philip Berisk and Eamonn Keogh (2016). EEE ICDM 2016. [pdf] [slides] Shortlisted for best paper award. Matrix Profile III: The Matrix Profile allows Visualization of Salient Subsequences in Massive Time Series. Chin-Chia Michael Yeh, Helga Van Herle, Eamonn Keogh (2016). IEEE ICDM 2016. [pdf] [slides] Supporting Page. Matrix Profile IIII: Using Weakly Labeled Time Series to Predict Outcomes. Chin-Chia Michael Yeh, Nickolas Kavantzas and; Eamonn Keogh. VLDB 2017 [pdf] Munich Germany. Matrix Profile V: A Generic Technique to Incorporate Domain Knowledge into Motif Discovery. Hoang Anh Dau and Eamonn Keogh. [pdf] KDD'17, Halifax, Canada. Matrix Profile VI: Meaningful Multidimensional Motif Discovery. Chin-Chia Michael Yeh, Nickolas Kavantzas, Eamonn Keogh. [pdf] ICDM 2017. Matrix Profile VIII: Domain Agnostic Online Semantic Segmentation at Superhuman Performance Levels. Shaghayegh Gharghabi, Yifei Ding, Chin-Chia Michael Yeh, Kaveh Kamgar, Liudmila Ulanova, and Eamonn Keogh. [pdf] ICDM 2017. Matrix Proﬁle X: VALMOD - Scalable Discovery of Variable-Length Motifs in Data Series. Michele Linardi ,Yan Zhu ,Themis Palpanas and Eamonn Keogh. SIGMOD 2018. Matrix Proﬁle XIII: Time Series Snippets: A New Primitive for Time Series Data Mining. Shima Imani, Frank Madrid, Wei Ding, Scott Crouter, Eamonn Keogh. IEEE Big Knowledge 2018. [expanded version PDF]. Time Series Joins, Motifs, Discords and Shapelets: a Unifying View that Exploits the Matrix Profile. Chin-Chia Michael Yeh, Yan Zhu, Liudmila Ulanova, Nurjahan Begum, Yifei Ding, Hoang Anh Dau, Zachary Zimmerman, Diego Furtado Silva, Abdullah Mueen, Eamonn Keogh. [pdf] Data Mining and Knowledge Discovery. Fast Similarity Matrix Profile for Music Analysis and Exploration. Diego Furtado Silva, Chin-Chia Michael Yeh, Yan Zhu, Gustavo E. A. P. A. Batista, Eamonn J. Keogh: (2017). IEEE Transactions on Multimedia [pdf]. Time Series Chains: A Novel Tool for Time Series Data Mining.Yan Zhu, Makoto Imamura, Daniel Nikovski, and Eamonn Keogh. "Best of" track in IJCAI 2018. VALMOD: A Suite for Easy and Exact Detection of Variable Length Motifs in Data Series (2018). Michele Linardi, Yan Zhu, Themis Palpanas, Eamonn J. Keogh: Demonstration track. SIGMOD Conference 2018: 1757-1760. Domain Agnostic Online Semantic Segmentation for Multi-Dimensional Time Series. Shaghayegh Gharghabi, Chin-Chia Michael Yeh, Yifei Ding, Wei Ding, Paul Hibbing, Samuel LaMunion, Andrew Kaplan, Scott E. Crouter, Eamonn Keogh. Data Mining and Knowledge Discovery. Super‐Efficient Cross‐Correlation (SEC‐C): A Fast Matched Filtering Code Suitable for Desktop Computers. NS Senobari, GJ Funning, E Keogh, Y Zhu, CCM Yeh, Z Zimmerman. (2018) Seismological Research Letters [pdf]. The Swiss Army Knife of Time Series Data Mining: Ten Useful Things you can do with the Matrix Profile and Ten Lines of Code. Yan Zhu, Shaghayegh Gharghabi, Diego Furtado Silva, Hoang Anh Dau, Chin-Chia Michael Yeh, Nader Shakibay Senobari, Abdulaziz Almaslukh, Kaveh Kamgar, Zachary Zimmerman, Gareth Funning, Abdullah Mueen, Eamonn Keogh.Data Mining and Knowledge Discovery [ pdf]. Please note this code is not STAMP or STOMP, but SCRIMP++ (which appears in Matrix Profile XI), which is as fast as STOMP, but also an anytime algorithm. The code is wrapped inside a simple Matlab GUI (that adds a lot of time overhead), to allow non-specailists to interact with their data. If you are writing a paper, please do not comparing timing results to this version, it would not be fair to us (contact us for the faster, but less user friendly code). The first is a valley happens during a dive. 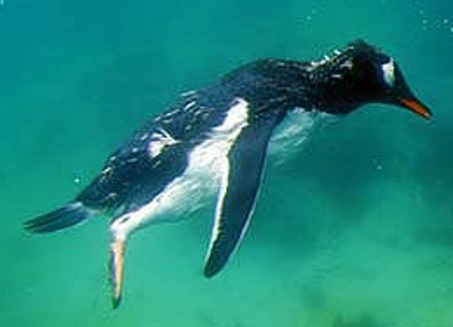 The third motif, a W shape followed by a long constant, happens when the penguin. Happy motif hunting, from the Matrix Profile team.